Magic With A Twist is proud to offer the Balloon Typhoon. This clown faced inflatable is the perfect thing to add to your next event for balloon blowing fun! Mix in kids with dozens of swirling balloons in an enclosed inflatable play area and you've got a winner! This inflatable clown has an adorable smiling face with see-though eyes so that parents can watch all the fun. (There is another window on the side as well.) 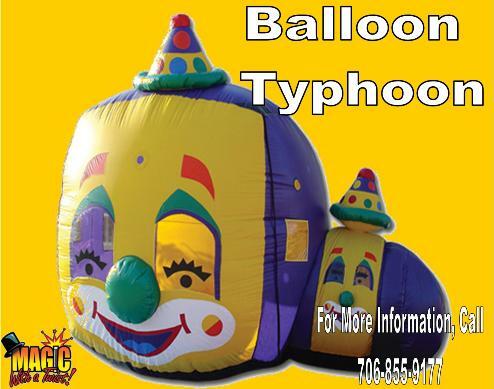 The Balloon Typhoon is 12�wide by 15�long and 12� tall. This unit does not have a weight limit so even the adults can play. The constantly moving air causes balloons to swirl around inside, up and down and side to side. Kids absolutely love it! The Balloon Typhoon is great for playing games and teaching. You can give kids a task to catch a balloon that is a specific color or one that has a letter written on it. For carnivals and festivals, you can attach strings to the balloons and allow each child to keep the balloon they catch. You can also put small items such as toys inside the balloon and have the child pop the balloon to get their prize. For Grand Opening or Special Sale Events You can place a coupon or raffle ticket in each balloon and have the children pop it to receive a prize (like a free hot dog or drink) or a coupon for their next visit. There are hundreds of promotional uses for the Balloon Typhoon! Unit comes with 50 balloons and a pump for quickly inflating the balloons. The Balloon Typhoon requires a relatively flat area about 20� x 20� and within 100' of an electrical outlet. We prefer to set the inflatable up on grass but some concrete or asphalt maybe acceptable as well.